Dr Kahanov is from the College of Health Sciences, Misericordia University, Dallas, Pennsylvania; and Dr Games, Dr Eberman, and Mr Inskeep are from the Athletic Training Education Program, Indiana State University, Terre Haute, Indiana. Address correspondence to Leamor Kahanov, EdD, ATC, College of Health Sciences, Misericordia University, 301 Lake Street, Dallas, PA 18618; e-mail: LKahanov@misericordia.edu. An 18-year-old African American male track and field sprinter presented to the athletic training room for left posterior shoulder soreness. He had no history of injury, had full range of motion and strength, and had 3/10 pain in the posterior shoulder with and without movement. When the athlete reported to the sports medicine clinic 3 days later, his pain had decreased to 1/10. The next day (4 days after the initial evaluation), the athlete returned with increased discomfort and swelling in the left upper arm (Figure), but he maintained full range of motion and strength. The athlete primarily trained as a sprinter, but he routinely lifted weights as a component of his training regimen. The athlete was referred to the track and field team orthopedist the same evening, who diagnosed a potential blood clot in the upper extremity, and he was immediately referred to the emergency department (ED). Swelling of the left upper extremity due to inflammation. Because of the direct referral from the orthopedist, the athlete was admitted to the ED. The athlete indicated an identical history and left upper arm pain as on his initial presentation. The specific mechanism of injury was unknown. The athlete did not have a history of cigarette smoking or drug use. Physical examination indicated normal range of motion, radial pulse, and capillary refill. Tenderness of the posterior upper left arm was noted. Radiographs were unremarkable, as were all other physical examination findings. The attending physician reported that the evaluation results did not indicate the need for further special tests, such as spectral Doppler. The athlete was diagnosed with upper arm edema. He was discharged and instructed to seek follow-up care the next morning with a primary care physician. However, upon further consultation between the attending physician and the team’s primary care physician later the same evening, the athlete was readmitted. Blood work results from the earlier admission indicated that his D-dimer was high at 1840 µg/L (normal range = 0 to 399 µ/L). The athlete was administered anticoagulant medication (heparin), and venous imaging was scheduled for the next morning. The morning after the ED evaluation, venous imaging with spectral Doppler indicated normal venous flow in the left jugular, a thrombus in the left subclavian—axillary veins, and normal venous flow in the brachial vein. The athlete was diagnosed with a potential upper extremity thrombosis and referred to a cardiologist with specialty in hematology. On review of the athlete’s findings, the specialist advised removal from contact sports, continued anticoagulant medication, and scheduled a venous catheter placement. The athlete was diagnosed with PSS, with a note that an overdeveloped left deltoid may have precipitated the syndrome. Five days after assessment at the ED, the athlete underwent a venogram, with placement of a thrombolysis catheter to remove the clot. Following the thrombolysis procedure, the athlete was referred to a surgeon for thoracic outlet decompression. Twenty-nine days after the ED evaluation, the athlete underwent an excision of the first rib and release of the scalene muscle. A venogram performed 12 days after surgery verified clot resolution. The athlete remained inactive for 6 weeks until he was released to participate in a running progression. Eight weeks after surgery (12 weeks from diagnosis), he was cleared for full participation with no recurrence of PSS. 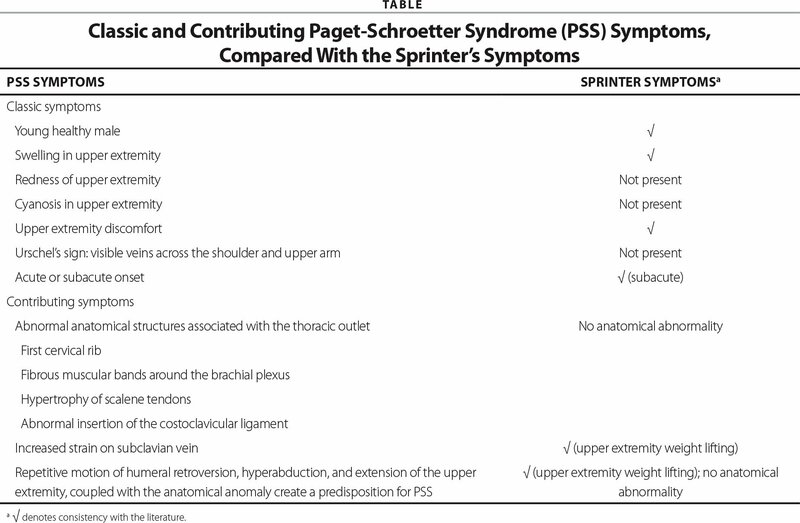 Paget-Schroetter syndrome is an effort thrombosis in the axillary–subclavian vein, which is typically caused by excessive upper extremity activity.1–7 Paget-Schroetter syndrome is effort related and occurs in approximately 2 of 100,000 individuals per year.4,7 The syndrome appears to occur from increased strain on the subclavian vein due to congenitally abnormal anatomical structures associated with the thoracic outlet, including the first cervical rib, fibrous muscular bands around the brachial plexus, hypertrophy of scalene tendons, and abnormal insertion of the costoclavicular ligament.1,4,8 Paget-Schroetter syndrome is present in 30% to 40% of cases of axillary–subclavian vein thrombosis, with men constituting twice the affected population as women.9 The dominant limb is affected in 60% to 80% of cases9 and is most common in athletes whose sport involves the use their upper extremities, such as tennis and volleyball players, weight lifters, wrestlers, gymnasts, swimmers, baseball players, and rowers.1 The athlete described in the current case, although a sprinter, was an avid weight lifter, which may have contributed to the onset of PSS. The literature suggests return to participation, particularly for weight lifting, within 4 months after resolution of PSS.15 The athlete in this case returned within 3 months of diagnosis, which is earlier than the standard accounts in the literature. The early return was based on resolution of the thrombosis and recovery with full function after excision of his first rib, which may have been, in part, due to his fitness prior to surgery, indicating the necessity for individualized assessment for return to activity. Practitioners evaluating athletes with potential PSS should investigate activities beyond the sport-specific extremity. Athletes with symptoms that include swelling and discomfort, which are either excessive or increasing in severity over time, should be referred for further evaluation and diagnostic testing. Paget-Schroetter syndrome presentation varies from acute, often mimicking a muscular strain, to chronic injury symptoms of pain and inflammation. Thus, any indication that the patient perceives as arm heaviness, redness of the arm, cyanosis, and dilated visible veins across the shoulder and upper arm should be referred for additional diagnostic testing. Although the athlete described in this case is a sprinter, his additional weight-lifting activities potentially precipitated the syndrome. The syndrome may be overlooked if a detailed history and an understanding of the athlete’s training regime is omitted or incomplete. This athlete underwent successful treatment and return to participation in a quicker time period than is consistent in the literature. Practitioners should, as always, take a thorough history, consider all possible effort-related activities, and use pain as a guide for return to activity. Paget-Schroetter syndrome is a rare condition; however, the etiology of effort thrombosis in athletes who use their upper extremities requires practitioners to have a working knowledge of the syndrome. Signs and symptoms may be elusive; therefore, appropriate referral and diagnostic tests are necessary for complete resolution. Alla VM, Nataraja N, Kaushik M, Warrier R, Nair CK. Paget-Schroetter syndrome: review of pathogenesis and treatment of effort thrombosis. West J Emerg Med. 2010:6(4);358–362. Hurley WL, Comins SA, Green RM, Canizzaro J. Atraumatic subclavian vein thrombosis in a collegiate baseball player: a case report. J Ath Train. 2006;4(1):198–200. Doyle A, Wolford HY, Davies MG, et al. Management of effort thrombosis of the subclavian vein obstruction. Ann Thorac Surg. 2007;21(6):723–729.